It had been a year since I had last seen the red barrel mailbox which marks the entrance to Spearhead Ranch. The first time was 1999, and I recalled that these people must get a lot of junk mail to need a mail box that could double as a bait barrel for black bear hunting. As I began the six-mile drive to the ranch, it came to me that Spearhead owners, Frank and Elaine Moore, not only have great antelope hunting, but also the world’s longest driveway. I don’t think I had gone a mile when I pulled my truck off the road, parked, and got out to stretch. To the east, a half mile away, I could see a large group of antelope milling around. Grabbing my binoculars I started searching through the group when I spotted a nice buck. His horns were tall and heavy. “It’s good to be the King, eh sport,” I said out loud, as I admired him. As I put my binoculars away and climbed back into my truck, I smiled and silently thanked the Lord for this day and place. It was wonderful to be back in Wyoming and hunting antelope again at the Spearhead Ranch. Topping a hill near the end of the drive, I could finally see the ranch and outbuildings nestled below. 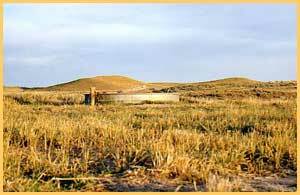 Antelope Creek winds down through this portion of the ranch and provides a natural windbreak for various buildings that are necessary to maintain a 100 square mile cattle and sheep operation. From my truck, I could see the dining hall, and I wondered if Shirley Olson, Spearhead chef, was baking cookies, or plotting to keep me out of her kitchen for the next five days. After I parked my truck, it was time for handshakes and hugs. The men of the Spearhead know the value of a firm handshake and the ladies always know how to make me blush with hugs and kind kisses. Again, it was wonderful to be back in Wyoming. After a late evening meal that left my 240# frame wondering if it would ever need feeding again, I settled into my room and prepared my daypack for the following day’s hunt. As I loaded the pack, I checked each item against my list: Lip balm, flashlight, suntan lotion, binoculars, camera, film, knife, baby wipes (nothing better for cleaning your hands), thermos for my morning coffee, extra sweater, fingerless wool gloves, spare shooting glove, extra bowstring, t-paper (you never know), cell phone, and water bottles. Next, I strung my Bob Morrison takedown and laid it on the spare bed in my room. The 58” recurve packs 57# of antelope punching power at my 27 inch draw. Because the bow has a rich, deep brown pakka wood riser, I affectionately named it, “Bart the Bow,” in honor of my grandson’s favorite movie star, Bart the Bear. Next to Bart, I placed five Gold Tip arrows, each weighing nearly 600 grs. and sporting Grizzly broadheads. I was all set. The next morning came too quickly. My body was still on “Kansas time” and I hadn’t completely recovered from the 800-mile drive when the alarm clock announced it was 5AM and time to start moving. With eyes half open, I stumbled from my room to the dining hall and into the men’s room. Staring at the mirror above the lavatory, I began to question why my wife of 34 years tolerated such a grim looking mug in our home. After a quick breakfast of Shirley’s homemade Danish, I returned to my room to gather my gear. Mid-September temps can be cool in Wyoming. In fact, two years earlier Bowsite founder, Pat Lefemine and I were hunting the Spearhead in near blizzard conditions, so a hunter is well advised to be prepared for all kinds of weather when hunting the Cowboy state. 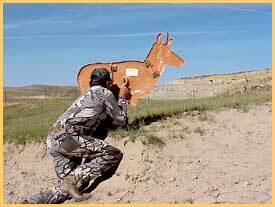 Hunting antelope from a ground blind requires little, if any, camo clothing. Any dark clothing will do fine. Some hunters darken their faces, but honestly, I’ve never felt the need. 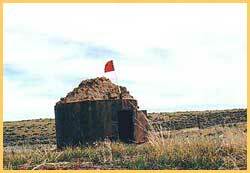 The blinds on the ranch range from wooden structures covering a pit, to steel tanks halfway buried in the earth. Each blind is roughly 15 yards from a water hole, and it is the water that draws the Prairie Speedsters within bow range. I always tell people if they don’t know much about themselves, they will after spending 13 hours in an antelope blind. Antelope hunting is no cakewalk; blinds can feel like an oven when the temperatures climb, or a meat locker if temps drop. However, the long hours are a small price to pay for watching these amazing animals. After grabbing my lunch, bow, and gear, Frank drove me out to a blind, and wished me good luck. It was still an hour before daylight. I made myself comfortable and poured myself a cup of coffee. Enjoying the coffee and clear morning air, I thought back to the year before when I had missed a magnificent P&Y buck at 15 yards. Actually, I missed him twice! The buck had appeared suddenly at the water and began drinking when my first arrow sailed harmlessly over his back. The buck bolted, ran in a small circle, and returned to the exact spot. Again, I fired an arrow, and again it sailed harmlessly two inches over his back. I found both arrows less than a foot apart in the dirt. 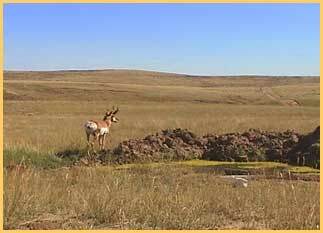 This nice pronghorn buck surveys the prairie before settling down to drink. opening. The effect on the hunter’s brain is like looking through a tunnel and it causes the instinctive shooter to overestimate the distance. It’s tough, plain and simple. The only real cure is to take a couple of practice shots and try to completely ignore the opening. This has caused me problems every year I have hunted antelope, simply because I never look at my arrow when I’m shooting, nor do I estimate distance when shooting. If you use a sight or the gap method of aiming, there is no problem. But, for those who are instinctive shooters, the best advice I can give is take a large piece of cardboard, cut a one foot by two foot opening, and practice at home first. Antelope can come to water in a number of ways. Sometimes they will just storm in and begin drinking. The next group may stand back and watch before approaching. Antelope are probably most famous for taking false drinks; they will start to lower their heads as if to drink, and then suddenly jerk their heads up to look around for danger. Antelope may jerk their heads in this manner several times before settling down to drink. When the antelope become relaxed and begin to drink, the throat muscles can be seen clearly working. If the distance and the angle are good, that’s the time to shoot. As daylight lifted its veil, sagebrush landscape filled the opening in my blind and I saw a color I hadn’t known in four years of hunting the Spearhead - green. Frank and his guides had warned me the night before that recent rains had left much of the ranch’s reservoirs and ditches holding water. That’s bad news when antelope hunting because it creates a countless supply of waterholes for thirsty speedsters. Regardless, I was in Wyoming and hunting antelope, and that was all I cared about. As the morning progressed, a strong southwest wind began to develop, cutting across the face of my blind at a right angle. By early afternoon powerful gusts were hammering the sagebrush. At 3pm a large buck appeared. His horns were tall with a heart-shaped sweep at the tips. He had a lot of mass, and I knew he would score in the mid-seventies without any problem. As he approached the blind it was as if he was walking on broken glass. This buck wasn’t carrying a P&Y rack because he was stupid; there was something wrong about the blind and he knew. Still, he cautiously walked in, giving me a quartering shot at 15 yards. As I released the arrow, I knew the buck was mine. But once outside the blind, it was quickly slammed sideways by the force of the wind. Suddenly, it was no longer a beautiful straight shaft, but an oblong object flying parallel to its target. The arrow missed its mark and I cringed! The buck was gone. He simply trotted away as if nothing had ever happened. The balance of the week was cursed with more periods of rain. Yet, with all the moisture, 8 out of 10 hunters scored, with the vast majority of the bucks making book. So why write an article when the hunter doesn't get a buck? Because for me, it’s all about hunting - not killing. Did I have a good hunt even though I didn’t score? Of course I did, and I’ve already booked for 2003. The opportunity was there, I just made a mental error and it cost me my best antelope to date. I've always been critical of myself regarding hunting because it means so much to me. Hopefully it makes me a better hunter. Going home empty-handed didn't bother me at all. What bothered me was I knew I could do better, and in that, I let myself down. Killing a lesser buck would have never satisfied me. And, rather than just kill any antelope for the sake of filling my tag, I take great joy in knowing the buck that got away is having the last laugh - at least for now. So, hopefully other hunters will find value in my words. 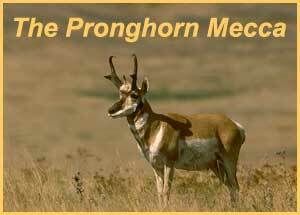 I’ve tried to give you some insight as to what antelope hunting is all about at one of the finest ranches in the west - the Spearhead Ranch. 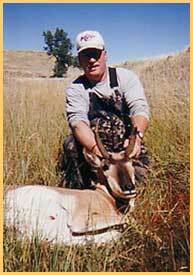 Dal Lowrey is a frequent visitor of Spearhead Ranch and has taken both pronghorn and mule deer over the years. Dal hunts with a Morrison Recurve, Gold Tip Arrows and Grizzly Broadheads.